When I completed my teacher licensure coursework only a few years back, I would have characterized myself as a die-hard believer in John Dewey, Alfie Kohn, flexible seating and student-centered learning. I believed children learned best by doing, that teacher-talk should be limited in a “readers/writers/math workshop,” and that group work and personalized technology were the future of education. I didn’t realize it at the time – probably because my teaching philosophy was identical to much of my cohort – but I was unwittingly indoctrinated in the educational progressive’s interpretation of constructivism. I assumed what I was being taught in teacher training was best practice, until I started reading books that were not on any of my syllabi. I was able to gain some perspective and insight into the history of this philosophy of teaching after reading Education is Upside-Down by Eric Kalenze. In his book, Kalenze traces the origins and current dominance of the progressive movement in education and the constructivist pedagogy it has defiantly sworn to be the future of learning. While progressive educators will decry that it is they who are the underdogs desperately trying to save children from oppressive schools and teachers with “old-school teaching methods,” the reality is the opposite. Constructivism has been the dominant dogma and unquestioned ideology in U.S. teacher training and professional evaluation for quite some time. Constructivism is the undercurrent that continues to fuel “balanced literacy” and discourages math teachers from teaching standard algorithms. Kalenze, E. (2014). Education is upside-down: Reframing reform to focus on the right problems. Rowman & Littlefield. Constructivists will claim it is oppressive for a teacher to dictate what a child should learn; instead, instruction should be centered around individual student interests. Taking it even further, constructivists will declare that “anything that can be Googled doesn’t need to be a main focus of students’ learning.” A misinterpretation of both Bloom’s Taxonomy and the Dales Cone of Experience showing students remembering 90% of what they teach others and 5% is frequently cited as primary evidence. In this piece I will outline three cracks in constructivism. These three holes in the pedagogy are the primary reasons I changed my mind about what good, effective teaching looks like since leaving my teacher training. First, constructivism is misinterpreted as a pedagogy; second, constructivism ignores basic cognitive science if used without proper scaffolding or at the wrong time in the learning process; and third, current prioritizing of constructivism in teacher training, at the expense of more direct forms of instruction effectively reinforces educational inequities for students. The most persistent flaw in constructivism is that it was was created as a theory to explain how an individual learns, and has since been widely misinterpreted as a teaching pedagogy that is characterized by minimal guidance and individual interests. So yes, constructivism is an instructive theory of learning when viewed through the individual lens. It explains how we are only ever able to create partial representations of the world that are very context dependent and constructed by our individual perspective. But in translating this individual theory of learning into a class-wide pedagogy centered around individual choice and minimal teacher guidance is where everything falls apart. For example, rather than spending multiple class periods allowing each student to discover and teach other classmates their self-generated strategies to divide numbers, it is far more efficient to clearly model and teach one representation (e.g. the standard algorithm) and then provide students with multiple opportunities to gain repeated exposure and practice with that partial representation. Once student mastery is demonstrated through practice and repeated exposure, then additional partial representations of the division algorithm can be added – showing remainders as decimals and fractions, converting improper fractions to mixed numbers and so on. The layers of understanding build on each other to over time create a stronger, more cohesive schema to be stored in long-term memory. Routine sequencing, retrieval, and interleaving further strengthens these schemas. In constrast, constructivist pedagogy atomizes and individualizes each student’s learning by providing minimal guidance, leading to partially-developed conceptual understandings and misconception-riddled partial representations that vary from student-to-student and are hard to diagnose and clarify by teachers. This section detailed how constructivism has been misinterpreted and misapplied as a pedagogy. The next section will outline how poorly-timed constructivist teaching ignores basic cognitive science research on the difference between expert and novice learners. Kirschner, Sweller, and Clark’s (2006) Why Minimal Guidance During Instruction Does Not Work: An Analysis of the Failure of Constructivist, Discovery, Problem-Based, Experiential, and Inquiry-Based Teaching demonstrates that constructivism and the various other names for minimally-guided instruction (e.g. discovery learning, problem-based learning, inquiry, experiential learning) have limited research showing their effectiveness. Yet new versions of these constructivist pedagogies with new names continue to emerge almost every decade (“personalized learning” is the latest variation fueled by the Silicon Valley Narrative). Why might constructivism and it’s emphasis on minimal guidance not have much supporting evidence? One reason might be that in constructivist pedagogy, there is no recognition of the brain’s working or long-term memory, let alone the profound differences between novice and expert learners. Every student is treated as an expert in their own individual interests – as though they are already little mathematicians, scientists, and authors immediately, making for great optics and “messy teaching” but questionable learning outcomes. 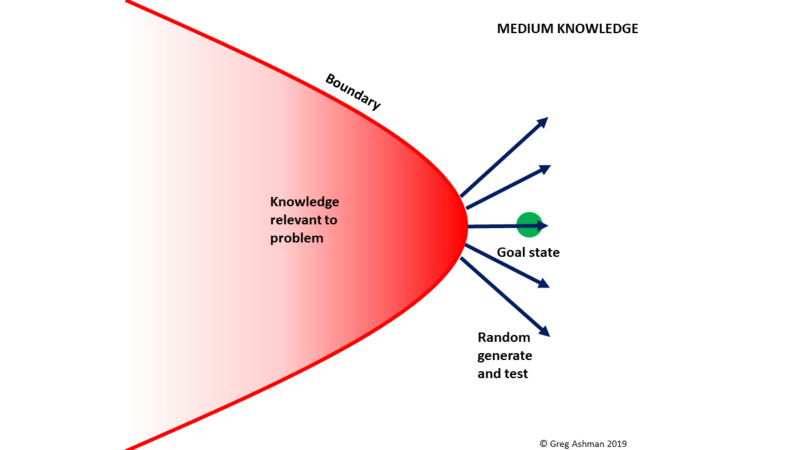 According to Kirschner, Sweller, and Clark (2006), when expert learners are confronted with problems, they are able to draw on a large reservoir of background knowledge and experience stored in long-term memory. In contrast, novice learners have limited background knowledge and simple information retrieval places a heavy demand on working memory. The importance of fluent and flexible recall is also highlighted in the National Research Council’s book How People Learn: Brain, Mind, Experience, and School (2000). They write that experts can “chunk” and organize knowledge around important ideas and concepts, which lightens the working memory load and makes for faster retrieval. Importantly though, this fluency does not mean that thinking is less creative or thoughtful. How Experts Differ from Novices.” National Research Council. 2000. How People Learn: Brain, Mind, Experience, and School: Expanded Edition. As fluency and long-term memory develops, Andrew Martin (2016) found that achievement, motivation, and engagement increased at the early stages of learning. This solid foundation of content knowledge then allows for less-guided, more constructivist, approaches to be then deliberately introduced and scaffolded. So let me be very clear, I am not arguing for “all DI all the time.” There is a place for less-guided instruction (particularly to avoid expertise reversal effect), but certainly not at the beginning of the learning process. In addition, as constructivist, minimally-guided techniques often require teachers to combine and switch between DI, inquiry, and problem-based learning simultaneously in lessons (a legitimately difficult undertaking for any teacher), it would make far greater sense to equip new teachers with a strong skill set in explicit, direct instruction before adding in constructivist approaches. I personally aim for a 80% – 20% split, as described by Tom Sherrington. In summary, research has consistently shown that when delivered to novice learners, the minimal guidance enshrined in constructivist pedagogy results in minimal learning and little change in long-term memory. While all students are negatively impacted by constructivist pedagogies, those who come to school with the least robust background knowledge are certain to be the most negatively impacted. 60 percent of American fourth-graders are not proficient in reading. Results from the Nation’s Report Card show that fourth and eighth graders in the U.S. have made little to no gains in math or reading since 2015. Worse though, the country’s poorest-performing students scored worse in both subjects as compared to 2015, while the highest-performing students grew, further increasing educational inequity. Constructivism and progressive teaching practices, writes Citizen Stuart, are a tempting ploy that harms the most vulnerable. He argues that rather than “waiting for the poor to discover for themselves the alphabet, letters, calculus, astronomy, and the base knowledge that is passed generation-by-generation to the offspring of the rich so they can rule the world,” educators should simply directly teach content. Natalie Wexler’s piece To Attack Inequality, We Need A Different Kind Of Education pinpoints constructivism as an unhelpful and laissez-faire approach to education given the inequities we hope to overcome. Wealthier families are able to ride out ineffective constructivist teaching because they have much greater background knowledge and extracurricular experience to draw upon, which is shown to have the greatest influence on reading comprehension. Stockard, Wood, Coughlin, and Khoury (2018) determined that direct instruction could “substantially reduce current achievement disparities between sociodemographic groups” after looking at 50 years of data. Again, the evidence is clear and right in front of us. I hope to have shown through these three sections that constructivism is to be understood as a useful supplement to more direct forms of instruction. Unfortunately, many teacher training programs continue to slander direct instruction as “old-fashioned” and remain stubbornly attached to the romantic ideal of minimally-guided instruction and completely individualized learning. Evidence-based teaching methods like explicit/direct instruction are well-known and available and should be the first priority for new teachers to master. A nice read for someone who is not always able to read through all the eduspeak. And… here’s, last but not least, number 3 of our pingback marathon. Enjoy! You missed at least half of constructivist-based research and thinking by focusing almost exclusively on Piaget and his Cognitive Constructivism, associated with discovery learning, rather than Vygotsky and Social Constructivism, where direct instruction is a valuable tool. Huge omission or oversight. My argument does not change. Direct instruction should be the primary form of instruction when teaching new content, with opportunities for discovery/PBL later in learning process.